We provide Nuclear medicine imaging techniques that document both organ function and structure. Nuclear Medicine is used to diagnose a variety of diseases, including many types of cancers, heart disease and certain other abnormalities within the body. Most nuclear medicine procedures are performed using a gamma camera, a specialised camera that is capable of detecting radiation and taking pictures from different angles. The gamma camera detects a very small dose of a radioactive substance which is injected into a patient's body. This allows doctors to build up a picture of the way an organ such as a kidney, thyroid or heart is functioning. It also tells doctors about the progress of certain diseases such as prostate and breast cancers. We can gather medical information that might otherwise require more expensive diagnostic tests, surgical intervention or might not be available by any other means. Nuclear medicine imaging procedures often identify abnormalities (problems) very early in the progression of a disease - often long before some medical problems are apparent using other diagnostic tests. We have a GE Infinia Hawkeye double headed gamma camera. We offer a range of scans in nuclear medicine. 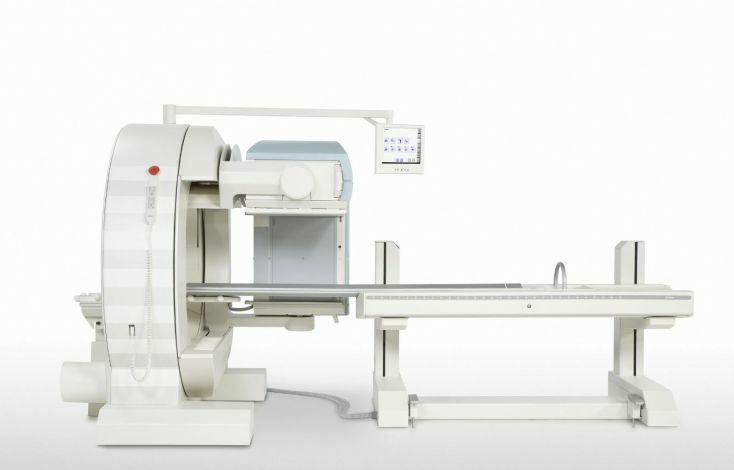 Bone scan - An isotope bone scan will show how quickly your bone tissues are working. Bone SPECT – An additional bone scan, this will show your bones in 3D. Blood loss scan - If you have an area of bleeding within your intestines, this scan can help find out where inside your intestines the bleeding is occurring. DMSA kidney scan - We can use this to see exactly where your kidneys are and to see their size, shape and how well they are working. Gallbladder scan, also called HIDA scan - An isotope gallbladder scan gives us pictures showing how well your gallbladder works. Gallium scan - A gallium scan takes place over several days and shows deep- seated infection. Gastric emptying – This scan shows the rate of emptying of your stomach and whether you have any reflux from your stomach into your gullet. HMPAO scan – this scan shows infection or inflammation such as Chrohn’s disease. Leukoscan - This is a test that shows if you have areas of infection or inflammation in your body, especially in joint replacements. Lung scan, also called Perfusion scan - An isotope lung scan whether or not you have a clot in the circulation in your lungs. This scan can be done on pregnant ladies. Lymphatic scan - The lymphatic system carries a colourless liquid called 'lymph'. A lymphatic scan is used to look at this system and see how well it is working. Meckel’s scan - A Meckel’s scan is used to look for the presence of stomach tissue in the intestine. Parathyroid scan - A parathyroid scan is used to show whether the parathyroid glands in your neck are enlarged. Renogram, also called MAG3 - A renogram gives us pictures showing how quickly the kidneys are functioning and if they are draining properly. Salivary gland scan – this shows the function of your salivary glands and if there is a blockage in the ducts draining into your mouth. Sentinel lymph nodes and ROLLs – these are injections to help show the exact location of breast cancer so that the surgeon can plan your surgery. Thyroid scan - An isotope thyroid scan shows how much your thyroid gland is functioning. Radiopharmaceuticals are radioactive materials that are used in very small amounts in each patient to diagnose disease; larger amounts are used in some hospitals to treat disease. They are attracted to ('lodge in') specific organs, bones, or tissues. The radiopharmaceuticals used in nuclear medicine emit ('give off') gamma rays, which are a high-energy type of radiation. Gamma rays can be detected by two types of specialised cameras: gamma and positron emission tomography (PET) cameras, which, in conjunction with powerful computers, can form images and display information about the area of body in question. The amount of radiation from a nuclear medicine procedure to diagnose disease is low. Patients will receive a full explanation of what is involved before any procedures.